Marc Jacobs is the Artistic Director of Coca Cola Light in 2013, succeeding among others Karl Lagerfeld. The American designer – who has just presented its New York namesake two collections for autumn / winter next – a tribute to the empowerment of women through the years 1980, 1990 and 2000, it uses three cans image collector of Coca-Cola Light, available now in limited edition. 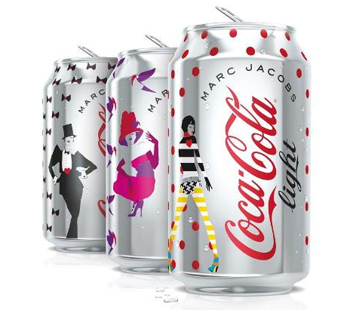 My favorite: the can Coca-Cola Light “I Love the 80’s” Marc Jacobs, representing the style male / female, with suit, bow tie and top hat-shaped. According to Marc Jacobs, the 1990s were marked by glamour and daring dress. The bobbin Coca-Cola Light “I love the 90s” and is embodied by a woman wearing a fuchsia dress, long gloves, high heels and a fedora extravagant. The bobbin Coca-Cola Light “I love the 2000s” revisits meanwhile the chic silhouette sport, played by geometric stripes, a bikini bottom foot hen and a red polka dot design referring to the designer collections.